Discover why Lisbon is nicknamed the ‘City of Light’ and admire the city’s magnificent skyline from an atmospheric vantage point as you cruise along the Tagus River. 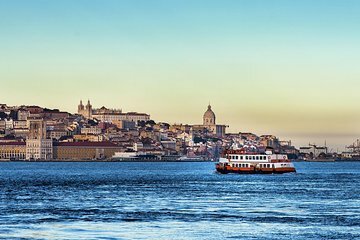 This private 2-hour sailing adventure offers spectacular views of waterfront landmarks like the Padrão dos Descobrimentos, Torre de Belém, and the Ponte 25 de Abril. Make your own way to the port at Doca do Bom Sucesso in central Lisbon, where your cruise ship will be waiting for you. Take a seat on deck and sip a welcome glass of wine or beer as you set sail along the Tagus River. As you glide around Lisbon, look out for waterfront sights like the looming Padrão dos Descobrimentos (Monument of the Discoveries), built for the Portuguese World Exhibition in 1940, and the 16th-century Torre de Belém (Belém Tower). Continue beneath the famous Ponte 25 de Abril bridge and see the striking Cristo Rei monument standing proud on the south bank. Then, cruise back along the north bank to admire the grand monuments of Terreiro do Paço square, the Cais do Sodré, and the Museum of Electricity. After two hours on the water, your tour ends back at Doca do Bom Sucesso.